"Vibe Magazine, Aug 2001 - Special Illustration Issue, fashion spread illustrations by Alvaro and styling by Angela Arambulo. 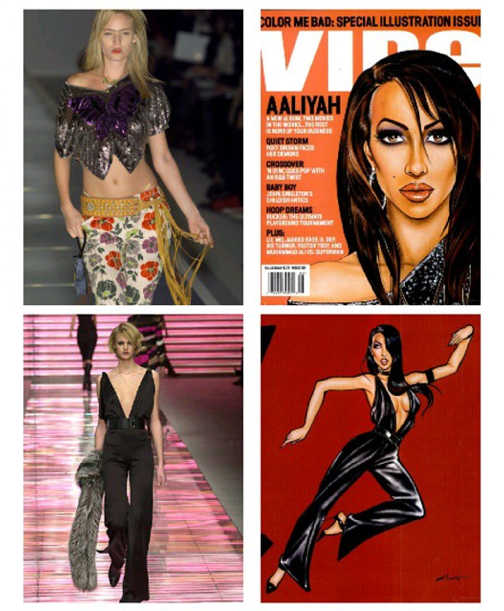 Even though these are not photos of #Aaliyah, these are beautiful illustrations pegged as a 'pending' fashion spread in the article, so I thought it would be cool to identify these runway items. Courtesy of The Aaliyah Archives, firstview.com and Style Bistro."